Woodstock is a picturesque, historic market town with a difference, thanks to its immediate, on-foot access to Blenheim Palace, a World Heritage Site often referred to as Britain’s greatest palace, and the birthplace of Sir Winston Churchill. The proximity of the palace makes Woodstock a great place to visit all year round. The grounds are particularly captivating in autumn, and there’s always something going on, from a Christmas craft fair, concerts and Battle Proms, to horse trials and jousting. Blenheim is also often used as film sets with recent productions including The Young Victoria and Gulliver’s Travels. Woodstock town is a collection of easy-to-explore historic, honey-coloured streets as lovely as any found in the Cotswolds. Wander in and out of interesting boutiques, unique art galleries and antique shops. 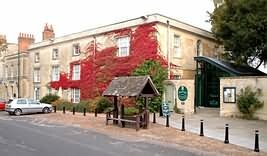 The Oxfordshire Museum in the heart of town tells the story of the ancient county, it’s natural history, Roman developments and archaeological sites. When you’re ready for a break, enjoy eclectic food choices in one of the many tearooms, coffee shops, pubs or high-end restaurants. Located just eight miles north of Oxford, Woodstock is ideally situated for visiting the great academic city, but also for visiting many other sites of interest, including Rousham House and Gardens, the ethereal abandoned village of Hampton Gay, and even a Roman Villa. Most of all, Woodstock is an ideal starting point for exploring the Cotswolds. 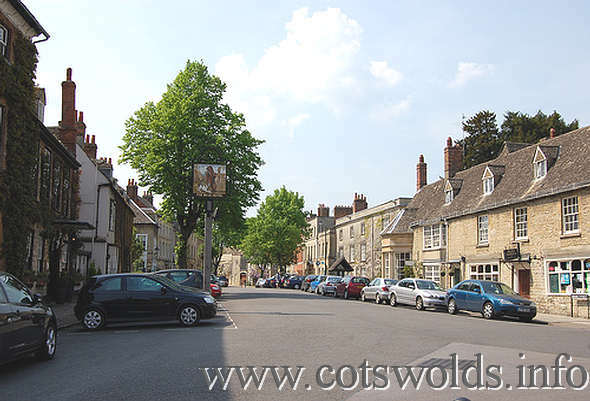 You could do a leisurely loop of a drive in just one day and see some of the area’s loveliest market towns and villages including Burford, Bourton-on-the-Water, Stow-on-Wold, Chipping Campden and Broadway. Strange Things - Why are there two Sundials in Woodstock? Woodstock, an old English word meaning “clearing in the woods,” grew up as a coach stop on the road north. The Domesday Book of 1086 describes it as a royal forest and English kings would often lodge in the area. 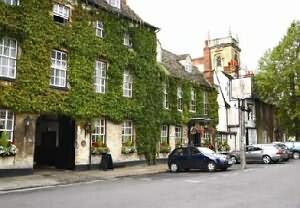 In fact, one of the most historic businesses in town today, the Bear Hotel, was providing refuge to travellers as far back as the 13th century when it was built as a coaching inn. The town is draped in history. Henry I kept a menagerie in the park, and Woodstock was the scene of King Henry II's courtship of (Fair) Rosamund Clifford. Battle of Blenheim, she committed to fund the building of what is now Blenheim Palace to replace the crumbling Manor. Thomas Chaucer (brother of Geoffrey Chaucer) and famous for being Speaker of the House of Commons, also lived in Woodstock – his house is marked by a heritage plaque at the foot of Chaucer Lane. But of course the town’s most famous historical connection is to Sir Winston Churchill, who was born at Blenheim Palace, spent much of his boyhood there, and today, lies at rest in Woodstock’s neighbouring village, Bladon, in a modest, family plot situated in St. Martin’s churchyard. Birthplace of Winston Churchill, World Heritage Site, and Britain’s Greatest Palace. Situated in Woodstock, just 8 miles from Oxford, Blenheim Palace is surrounded by over 2,000 acres of 'Capability' Brown landscaped parkland, the great lake, and beautiful formal gardens, offering an unforgettable day out for all. Open February to December. Dogs are welcome in the Park, on a lead at all times. However, dogs are not allowed in the Formal Gardens, Pleasure Gardens or Palace apart from assistance dogs. 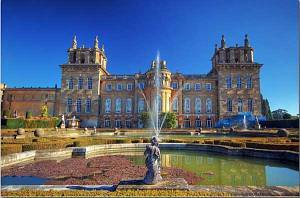 History of the Royal Manor of Woodstock and Blenheim Palace . 1.5 hours. From Stratford on Avon approximately 45 minutes. From Bath approximately 1.5 hours. It is not surprising that in an area once regarded as the centre of the weaving trade, you can embark on a unique 'Textiles Trail' at Woodstock which includes the world renowned Blenheim Palace Tapestries, the captivating Woodstock Wallhangings (on display at the Town Hall), the enchanting Stonesfield Embroidery (at the Oxfordshire Museum) and an extraordinary collection of over 100 kneelers at St. Magdalen Church. The Museum is open Tuesday - Saturday 10am - 5pm, Sunday 2 - 5pm. Admission is free. Tel: 01993 811456 for more information. The Town Hall is open Monday, Wednesday and Friday, 9am - 1pm. A representative is happy to talk to those interested in design, textiles or community projects. The clerk - Tel: 01993 811216; Email: info@woodstock-tc.gov.uk. Discover the history of an ancient county at the Oxfordshire Museum. Set in attractive gardens, the museum celebrates Oxfordshire in all its diversity and features collections of local history, art, archaeology, landscape and wildlife as well as a gallery exploring the county's innovative industries from nuclear power to nanotechnology and don't miss our life-size Megalosaur in the Dinosaur Garden. With interactive exhibits, a lively programme of exhibitions, events and activities for children and adults, the museum offers something for everyone. Four galleries of changing exhibitions and a sculpture court in our attractive gardens mean there is always something new to see. In the churchyard of St. Martin’s, Bladon, a couple of miles outside of Woodstock. In July 1895 Winston Churchill wrote to his mother: 'I went this morning to Bladon to look at Papa's grave . . . . I was so struck by the sense of quietness and peace, as well as by the old-world air of the place that my sadness was not unmixed with solace . . . ' . 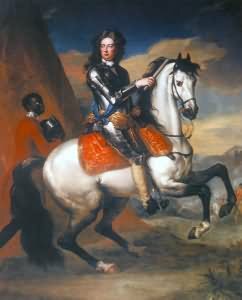 He often visited his parents' graves when he stayed at Blenheim Palace, and expressed the wish to be buried there himself. He died on 24th January 1965, exactly seventy years to the day after his father, and the funeral service took place at St Paul's Cathedral. It was a very moving occasion, marked with all the pomp & ceremony of Church and State. It was attended by the Queen together with rulers from all over the world and shared by the whole nation. In contrast, the burial at Bladon was private as his wife, Lady Churchill wished, with only close friends and family being present. Rousham House and Garden is a few miles northeast of Woodstock lieing in the Cherwell valley, mid-way between Oxford and Banbury, circa. 11 miles from each town. Rousham House is a grand testament to the work of famous building and landscape architect William Kent (1685-1748). The house, built in 1635 by Sir Robert Dormer and is still in the ownership of the same family. A country style house of free Gothic style and remodeled by William Kent in the 18th century. Rousham Gardens are open every day of the year from 10 am. Last admission is at 4.30 pm and the gardens close at dusk. Tickets for the garden are £5 per person. The House is only open by prior arrangement. The cost is £10 per person, with a mimimum fee of £120. Children under 15 will not be admitted unless by prior arrangement. No dogs are allowed in the gardens. There is no tea-room at Rousham but you are welcome to bring your own picnic lunch or tea. Located just a short stroll away from the lovely villages of Thrupp and Shipton-on-Cherwell lies a mysterious, abandoned settlement. The village is located in the Cherwell valley about 1.5 miles (2.4 km) north of Kidlington, Oxfordshire. There is very little parking at Hampton Gay village, so a good way to see the place is part of a circular walk. Here is a link (www.oxfordshire.gov.uk/cms/content/kidlington-circular-walk) for a 4 mile walk that takes in Hampton Gay on its route. Kelmscott Manor was the country Home of William Morris – Poet, Craftsman and Socialist – from 1871 until his death in 1896. Kelmscott Manor, is a grade 1 listed farmhouse adjacent to the River Thames and was built around 1600, with an additional wing added to the north east corner in about 1665. The Manor is built of local limestone on the edge of the village of Kelmscott. William Morris chose it as his summer home, signing a joint lease with the Pre-Raphaelite painter Dante Gabriel Rossetti in the summer of 1871. Morris loved the house as a work of true craftsmanship, totally unspoilt and unaltered, and in harmony with the village and the surrounding countryside. Open every Wednesday and Saturday, 11am to 5pm - Ticket office opens 10.30am. Last admission to the house 4.30pmThe house has limited capacity. Admission to the house is by timed ticket. The shop and licensed restaurant are open throughout the general public open times. Admission - Open start of April to End of October House and Garden: Adults £9.00; Children (8 to 16 years) £4.50; Students in full-time education and with a valid student's card £4.50; One carer accompanying a disabled person FREE. A unique working museum depicting Oxfordshire rural life in Victorian times. Cotswolds Wildlife Park is just south of Burford, set in 160 acres of gardens and parkland surrounding a listed Victorian Manor House, discover all kinds of exotic animals from rhinos to lions and red pandas. One of Oxfordshire’s top visitor destinations and one of the most beautiful wildlife attractions in the country. It is a wonderful mix of animals, landscaped parkland and gardens appealing to all ages. Many of the animals are rare and endangered, visitors can walk through the Madagascar enclosure with free-roaming lemurs and see meerkats, penguins and tropical birds in the exotically landscaped Walled Gardens. Dog Friendly. Open every day (except Christmas Day 25th December), with plenty of car parking. Explore the part-exposed floor plan of a large Roman Villa consisting of over 60 rooms including original mosaics first unearthed in 1813. Location 2 miles North of North Leigh; 10 miles West of Oxford, off A4095. Opening Times: End of March to December; Tel: 0870 333 1181. Minster Lovell Hall is situated next to the River Windrush and Minster Lovell Church and is the romantic ruins of Lord Francis Lovell's (he was Chamberlain to King Richard III) 15th Century Manor House. This is a wonderful place to add to your list of things to do in England. The ruins of the Hall are quite stunning, the countryside beautiful and the nearby church graveyard looks like what one would expect of an old country graveyard to look like. Worth a trip! Opening Times: Any reasonable time in daylight hours and FREE. Bicester retail village is ideal for shopaholics, this collection of over 900 chic outlet boutiques offers a unique outing in a man-made modern retail village selling international and British luxury goods such as Mulberry, Dunhill, Wedgwood, and Hugo Boss. Oxford is the best a cosmopolitan city has to offer, coupled with a history spanning over a thousand years – and of course, a famous, ancient university. Several Galleries covering displays about the natural history of Oxfordshire, Roman developments and archaelogical sites in the county and Childrens dynamic toys from around the world.